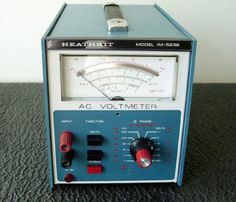 I have an old "trusty" Heathkit IM-5238 that I used for years. The only drawback to that meter is that it doesn't have the 100 kHz band-limiting filter of the HP-400FL I use for analog level measurements. A few years ago I pulled out the IM-5238 for a recap. Once I finished I re-checked the calibration and it was still spot on. Yesterday I pulled this old friend out of the closet and decided to check its calibration. The dB function didn't work. I popped the cover off and found the log amp pegged acting as if it had no feedback or an op amp pinned to the rail. Looking at it on the 'scope it was oscillating. A quick swap of the CA3046, LM308 and LM741 in the log detector did not repair the problem. After poking around in the circuit I discovered that the log amp's temperature compensator had opened. This was causing the log amp to have huge gain. I quickly bridged in a 1KΩ resistor and the dB function came back to life. The log amp and temperature compensation are a classic two op amp/two transistor circuit using a Tel-Labs "Q81" "+3300 ppm" wire-wound resistor. This particular kit used a brand I had never heard of: KRL. 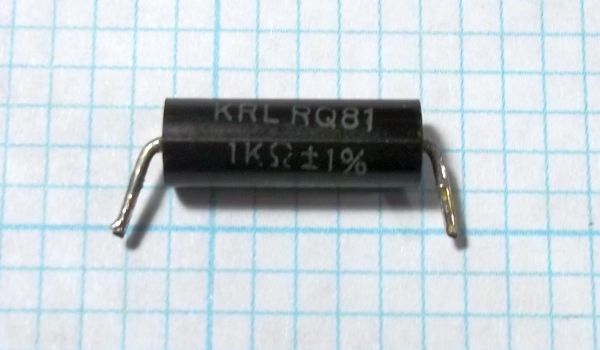 The part number is a KRL RQ81 1KΩ 1%. The date code was 7929: This part is 39 years old! But how did it fail un-powered in a climate-controlled closet just sitting there? There's not enough power available in that circuit to open a 1/4W resistor much less a "power" wire-wound one. KRL has a fascinating history: It's founder started Daven. Our roots go back to 1948 when Mr. Perry Sr. opened the Daven Company as General Manager, and his subsequent founding of RCL Electronics in 1960, from which no fewer than four "spin-off" resistor companies were born. Two companies are local to New Hampshire, KRL being one of the two. RCL employed over 600 employees locally under the administration of Mr. Perry Sr., and eventually went down to less than 40 employees after Mr. Perry Sr. retired in 1969. Under the direction of the Perry family, RCL was known to be the world's leader in Precision wirewound Resistors, both for sales and innovation. Mr. Perry came out of retirement in 1985, recruited Mr. Perry Jr., and purchased KRL Electronics, Inc. Over the past several years, KRL has maintained an aggressive approach to the migration of electronics from "through-hole" component printed circuit board (PCB) mounting to the new "SMT" surface-mount configuration for wirewound resistors. It's good to know KRL Bantry is still making +3500 ppm/°C temperature-compensating resistors. I installed the PT-146 in place of the failed RQ81. The 0 dB setting, based on earlier adjustment when the working RQ81 was installed, was within about half a needle width. The Heathkit actually has less tempco drift (none) than the HP-400FL "linear dB" meter which only has a 12 dB range with mechanical "log conversion" internal to the meter. The HP400FL drifts about 0.1 dB after warm-up. I have a pair of these I built in 1978; when I went into studio equipment repair in Nashville. i have never had a problem with them other than a sticking meter movement. The meters were made by Dixon & I was able to find a replacement at Sky Craft in Orlando. Simply swapped scales & 8nstalled it. I compared them with a friends HP 400 ac vtvm & they were accurate within 1/4 db; not bad at all. The only failure was in my big Lin-Log swept function Generator. Two tantalum caps in the power supply shorted; replaced, checked alignment & was good to go. Really a shame Heathkit did not survive. While not common I have seen resistors fail in odd ways. I few years back I repaired a cheap chinese battery charger for neighbor's mobility scooter. I didn't have a schematic but was able to figure out that a simple 1/4W carbon film resistor was nowhere close to the resistance marked on it... no sign of heat or physical stress. I replaced the resistor with another, not even the same exact value, but close enough to charge the scooter battery for more years. Still working AFAIK. In this case my judgement was that the failed resistor was just too cheap to work, or too cheap to keep working.